As the weather once again turns cold, it’s always good to be prepared for the inevitable. It’s cold, it’s going to get colder and remain cold. We need to think about those areas that can be impacted by those fridge temperatures. Now that the hoses have been disconnected. The sprinkler system is off and winterized. It is time to turn our attention to when it gets really cold. Some of us have those extra cold areas in our home, that when the temperatures dip and winds start howling that are prone to freezing. Those areas that get really cold are the spaces that may have a tendency to possibly freeze. It may not have frozen yet, but you question the possibility. This is the time to call your plumbing professional at Micro Plumbing, Inc. Why not check out those areas to see what can be done to PREVENT the potential of FROZEN PIPES? Most of the time it is just the matter of sealing up an area, insulating the plumbing or adding insulation to the area that is needed. 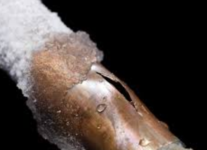 When pipes do freeze this is very stressful, time consuming and can be a costly situation. So why not be proactive and get these areas warm and keep them warm? So on those cold bitter nights, you’re not stressing. You’re sitting by the fireplace with your family and a hot cup of coffee in hand. Instead of trying to thaw those pipes, thinking what the cost might be and stressing if the pipe is going to break! Here are some tricks to try to prevent frozen pipe; open the cabinet doors, keep the pipes in the concerned area warm, or having a little trickle of water running to keep from freezing but sometimes this just isn’t enough. So why not skip this stress and give us a call. Micro Plumbing, Inc. is always here for you! We are here to help you in your prevention, the care and the service of all your plumbing needs. Big or Small, We Do It All!